The best way to establish the nature of The Blob is with a song. This little ditty by a young Burt Bacharach is the first impression of the franchise, playing over the opening credits. Unlike the chilling horror scores for filmmakers like Hitchcock, Argento, or Carpenter, The Blob has a theme song that you can dance to, something more in the neighborhood of The Monster Mash. If someone had never been exposed to The Blob before, they might expect a cartoon after hearing the song. I recommend that while reading this blog entry, you play the above song to get the full media experience. If you read faster than 2 minutes and 41 seconds, then you may want to scroll back up and play it again. The song is catchy and I’d be lying if I said I didn’t listen to it a dozen times or more during this Blogathon process. This post is part of THE GREAT VILLAIN BLOGATHON, hosted by Speakeasy, Shadows & Satin and Silver Screenings. Click HERE for a list of all entries. The song is a riot, but even the name is on the silly side. What is a Blob anyway? According to the dictionary, it is “a globule of liquid; bubble.” It is far from menacing, and instead is a playful, ridiculous villain, the type that would be right at home with the popcorn sci-fi double features of the 1950s. The reason the film was so successful and the song a hit has less to do with the scares, and more to do with the pop culture phenomenon of a funny little monster that resembles Play-Doh or a well-chewed piece of gum. I’ve already talked about the 1958 version of The Blob, but the 1988 remake is also worth recognizing as a significant part of the franchise, even if it has a slightly different tone as the original. It has plenty of teenage inadequacy and angst, but is expressed more in the palette of the 1980s. 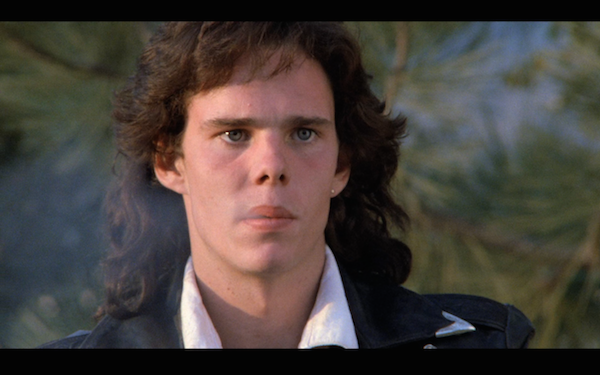 Brian Flagg (Kevin Dillon) is a renegade outsider, wears a leather jacket, has a mullet, and rides a motorcycle. Meg Penny (Shawnee Smith) is a pretty cheerleader who at first wants to date the star of the football team, yet later is thrown into the Blob hysteria with Dillon. Just by the way the characters are drawn, they fit the typical 80s theme of how children fit (or don’t fit) into different social cliques. Don’t mess with Kevin Dillon, aka “Johnny Drama” or his mullet. The remake takes itself more seriously than the original, but it is not without having a little fun at its own expense. For starters, it has the star football player buying condoms at the pharmacy for his hot date with Meg, and later discovers that his date’s dad is the same pharmacist. Doh! Most of the rest of its humor fits with the state of the horror genre in the 1980s. Some of the Blob’s attacks and kills are outlandish and you cannot help but laugh, which is a distinctively different atmosphere as the original, which celebrates and has fun with teenage life. So let’s talk about the monster itself. In both movies, it came from outer space. 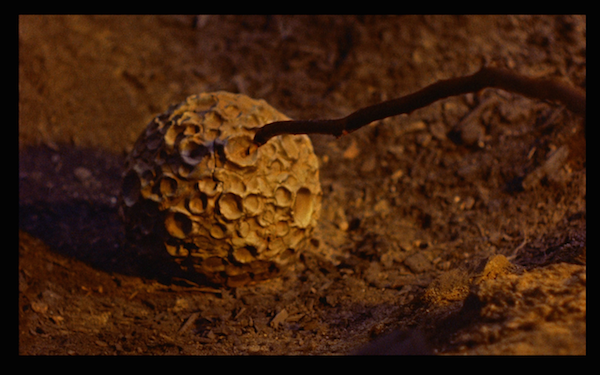 In both movies, it is discovered by a homeless person, who tries to touch the meteorite with a stick, only to get a piece of The Blob on his arm. In the original, he tries to shake it off like one would shake a stuck piece of rubber or glue. It’s just something disgusting that he wants off. This is when The Blob first gets its exposure to human flesh, and immediately wants more. It latches onto his arm and doesn’t let go. In the remake, they don’t waste time with having the homeless guy dance around trying to get a sticky mess off his arm. They instead go right for the gusto. 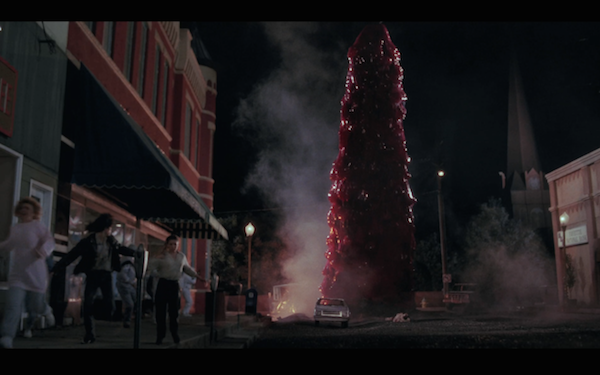 Once The Blob gets a whiff of humanity, it strikes and latches on with lethal precision. 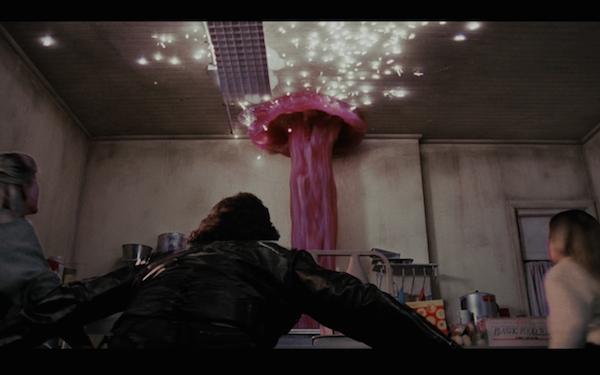 Again being playful, the remake cuts to kids eating jell-o. The colors of each film are worth discussing. One of the reasons that the original caught on was that it featured an extremely good use of color for the time. You can even tell from the screenshots that the color palette holds up reasonably well today. Of course by the time the 1988 version came along, color was not exactly groundbreaking, so they instead played around with the mise-en-scene. The school colors use pink, so cheerleaders at the football game have pink pom-poms. In one scene the use of color is addressed directly with Meg messing up the laundry and accidentally turning a sweater pink. Maybe that was an epidemic because there are many pink sweaters seen throughout the film. The remake had more flexibility with special effects to highlight the colors of the monster, and sometimes used that to color the frame. A good example of this is the phone booth scene where The Blob and one if it’s captives envelop the booth. 1988. A pink re-imagining of The Scream? The way they kill may not necessarily be different. 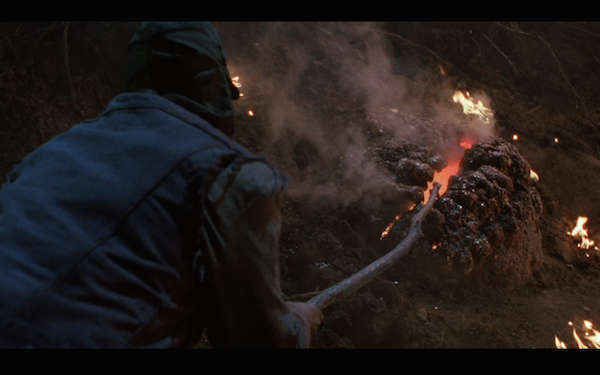 The special effects limitations for the 1958 version don’t allow us to see the all the deaths. Besides, for the time frame, anything remotely close to the graphic images in the 1988 version would be shocking and revolting. The old homeless man is found dead in both movies, although far too graphic in the second film for me to even post a screenshot. Steve and Nancy see the doctor dying, and presumably other people die as well, but most deaths are not on screen. 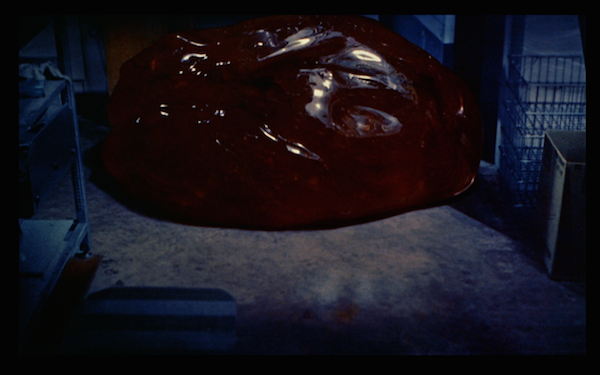 In both films, The Blob can kill by enveloping their victims and we’d assume they suffocate. 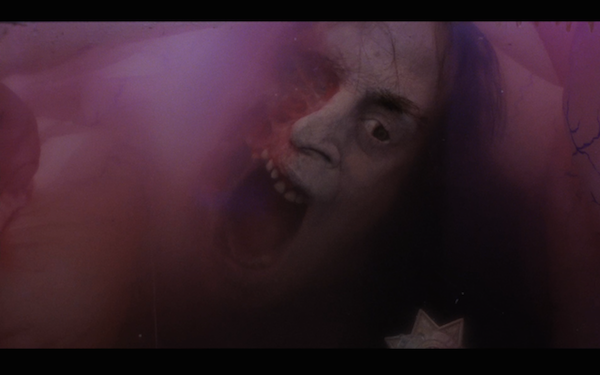 In the remake, The Blob also has the ability to dissolve their body as if they had been dipped in a vat of acid. That’s interesting because in the 1958 version, the nurse unsuccessfully tries to throw acid on The Blob, which has no effect. 1958. The nurse throwing acid. 1988. This guy is either about to suffocate or is addicted to Big League Chew. As for how The Blob gets around, Burt Bacharach mostly had it right, at least for the 1958 version. It creeps, leaps, glides, and slides. Where does it go? Across the floor, through the door, and around the wall. There are some movement similarities during the early portion of both movies. The Blob grasps at the homeless guy’s arm and gradually spreads to the rest of the body. From there, the 1988 Blob moves at a far more rapid pace. This could be another special effect limitation because we do not see the 1958 Blob move as much. After all, he was basically just a bag of silicone. There are some fun movement parallels between both movies. 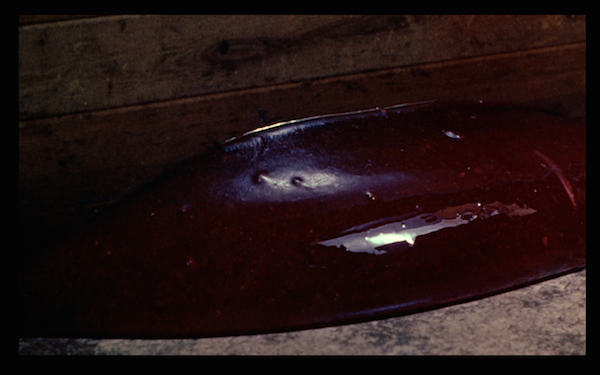 For instance when Steve and Nancy are in the closet, The Blob oozes under the door. When Brian and Meg are in the walk-in freezer, The Blob oozes similarly toward them. 1958. Oozing under the door. 1988. Oozing under the door. Another fun sequence in both movies is the theater. For 1958, the theater was groundbreaking in a sense. 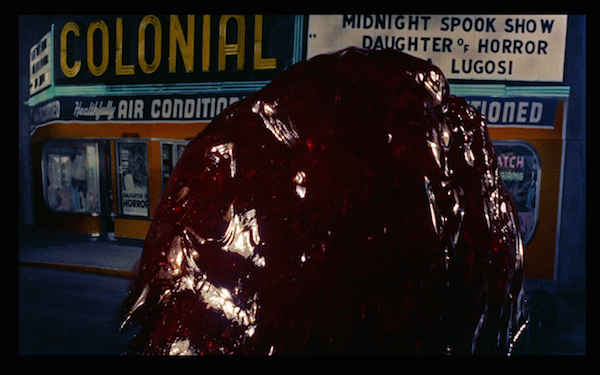 The late movie aspect of 50s teenage culture had not become a presence on film until The Blob, which used it as an exceptional plot device and a way to creatively show off the special effects at their disposal. The remake borrowed the movie theater plot, injecting some children who are seeing a movie that they shouldn’t. Again, it is a comic scenario, with an annoying guy who keeps talking loudly during the movie being the first to get Blobbed. What’s even funnier is that they show the scream in the movie as a reaction to this loudmouth’s quick demise. 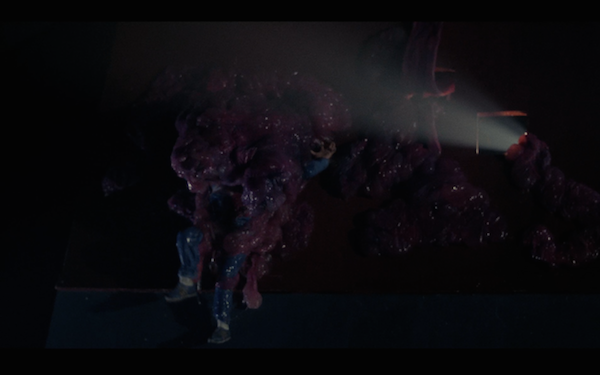 The Blob starts in the projection room of both theaters, coming in through the ventilation system, and then makes it into the theater itself, causing mass havoc. The 1988 screen is darker and the visual may not show up well. 1958. Oozing out of the projection. 1988. Oozing out of the projection. You can almost count on your fingers the number of times that The Blob appears in the 1958 version, and the screens that I’ve posted here represent a high percentage of the monster’s appearance. In the 1988 version, he is everywhere. When he appears, they make it a point to have him encompasses a large portion of the screen. 1958. 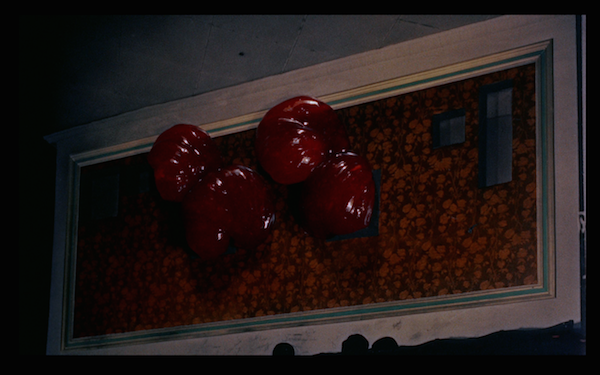 The Blob even goes to the movies. The conclusion is where the versions diverge. They have a similar ending in that The Blob is allergic to coldness. You could argue that the original was poorly written with a convenient deus ex machina ending as they discover this type of “Kryptonite” in the final act. The latter takes a more sophisticated approach, planting the seed of the aversion to coldness about midway in the aforementioned frozen locker scene. When The Blob oozes under the door, it oozes right back when it is exposed to the cool air. The latter version also has an origin story, scientists that implement a biological containment as if it is a virus, and some far-fetched explanations that I won’t spoil. I’ll be honest that I much prefer the earlier ending, ‘deus ex machina’ or not. It has that same element of teenage innocence that makes the rest of the film so effective, while the latter version suffers from “Summer Movie Syndrome.” If something is expensive, that does not necessarily mean it is better. 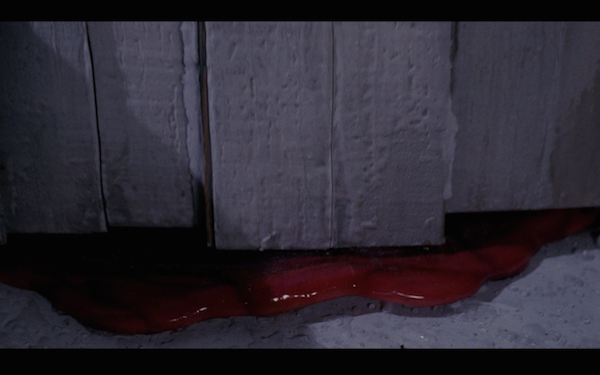 The Blob is so scary that this kid accidentally Birdman’d himself to the door. So what can we say about The Blob as a villain? In both versions, he’s a ferocious monster that basically eats people. I’d say that qualifies as a villain. The one thing I’ve purposely omitted from both write-ups until now is the representation of the red scare. In the 1950s, the symbolism of this nondescript menace that nobody understands is almost too obviously a nod toward the Cold War. 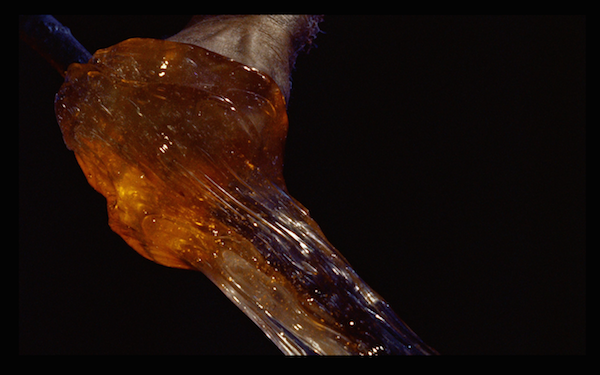 That was the real fear, and The Blob is one way that allowed people, particularly teenagers, to process the fear. The 1988 version was still in the midst of the Cold War, but the cultural sensitivity was not as pronounced. Instead they use the additional backstory plot as a way of referencing weaponization. Perhaps they wrote this as an homage to the original, to fit it into the Cold War theme that clearly existed. Or maybe it was a product of the times, way of processing Reaganomic escalation. Either way, any text that uses a being to portray a political or societal evil qualifies as a villain in my opinion. Posted on April 14, 2015, in Blog, Criterions, Film and tagged 1958, 1988, camp, cold war, horror, kevin dillon, movies, steve mcqueen, the blob. Bookmark the permalink. 13 Comments. I was really looking forward to your post, and you exceeded my high expectations. I even took your suggestion to listen to the (ultra fab) Blob theme song while reading. I love that kind of multi-media experience! I have never seen the 80s version of The Blob, but you’ve sold me. I have got to track it down! Thanks for joining the blogathon with this most colourful and unusual villain. P.S. Loved the screen caps + editorial comments! That is high praise coming from you! Cheers! I really did have a lot of fun writing this and cracked myself up. You cannot take The Blob seriously. You just have to roll with it and have fun. Completely agree that the theme is ultra fab. That Bacharach kid is going places! P.S. Don’t watch the 1988 version unless you want some bad, campy horror. I didn’t write a straightforward review, but it’s a mixed at best. That is a fierce mullet! The writers missed a layup. The mullet should have done the most damage while The Blob killed them off. I enjoyed your post immensely (and your captions had me literally laughing out loud). Of all the villains in the blogathon, yours is certainly one of the most unique! I’ve never seen the remake of this movie — and I really don’t think I want to (I think it’s probably too graphic for me), but I loved reading about both of them. Thanks so much for this fun and first-rate contribution! Thank you. Again, high praise! I’m glad my enjoyment came through in the post. Since this blog is usually serious and artsy, I might use these blogathons to play around and have fun. Although with the Grim Reaper on the beach, I might have written a check that my wit cannot cash. This was great to read and listen to, I haven’t seen the ’88 version either which is really shameful for someone who professes to love these types of movies. I need to do a double feature. You’re right about the colours, very impressive look in the first one, McQueen’s style is so much more lasting than the mullet 🙂 Loved reading this, so glad you joined in and had so much fun with it. Thanks and best! 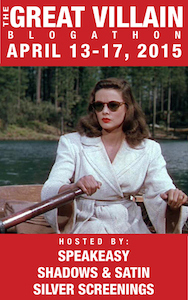 I feel like I’m repeating myself, but thanks again for hosting such a fun Blogathon. I’m glad you enjoyed the post! Wow, I’d completely forgotten the remake — and that I’d seen it — until enjoying this informative, witty blog post. Definitely the gooey-est of all villains! Gooey indeed! This was posted just a few days ago and only now do my hands feel washed. This is such a cult classic! To echo some of the other commenters, I too haven’t seen the 80s version, but I have seen ‘the original’ and I love how it blends sci-fi and teenage delinquency. Not genres you’d imagine would be compatible. 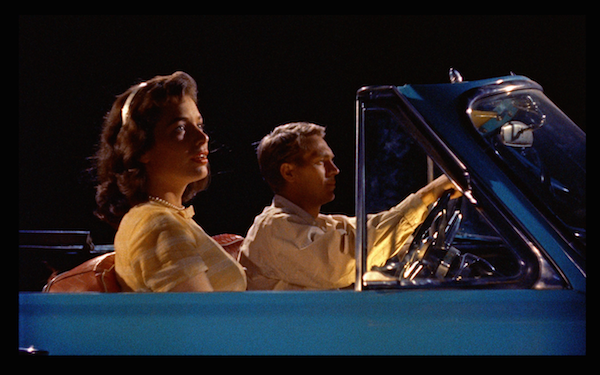 I love the colour palette too – films like this surely shouldn’t be so wonderful to look at?! For a smaller budget, non-Hollywood production, it seems unlikely that this type of film would have legs and resonate with so many people. I think it is a testament to the teenage themes and the color use that we still talk about it today.